Guys, February was something of a deluge. 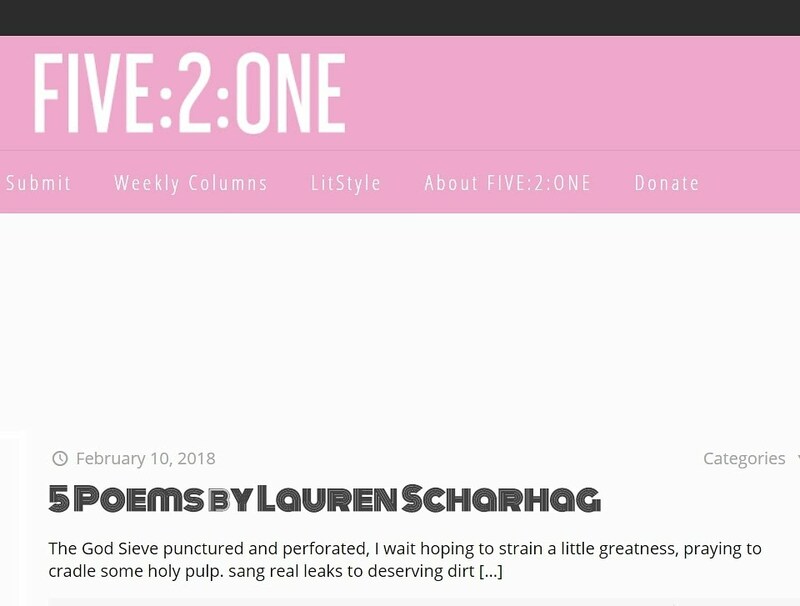 Ten poems in four magazines! I'm so pleased to share this with you. 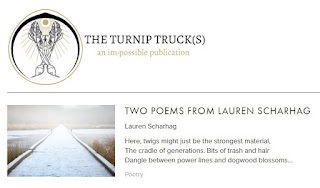 In Turnip Truck(s), two short poems appeared. One was "Pisces," which I wrote for fellow poet Eve Brackenbury to wish her a happy birthday a few years back. The other was "Nests." 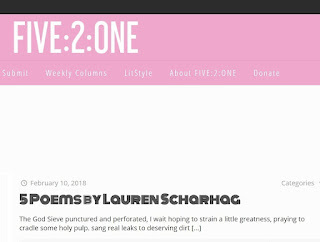 Five : 2 : One Magazine's #sideshow featured five short poems, "The Bus Ride," "Asphalt Fruit," "Looks Back Into You," "Running Barefoot" and "The God Sieve." You can not only read them, but you can listen to me read them! I notice that, more and more, lit mags are looking for multimedia submissions. I don't think I'll ever be cool enough to create short videos, or to properly perform my work like a real spoken-word artist would. All the same, I hope you enjoy my dulcet tones, along with the words. Ramingo's Porch included not only my poem, "Retconning," but an interview as well. You can read the latter on Ramingo's Blog here. 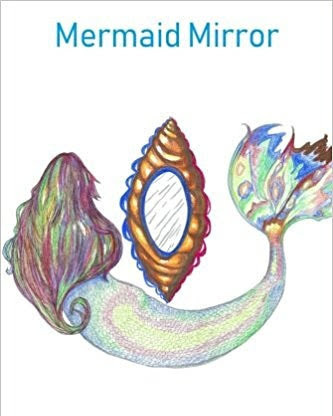 And finally, in Mermaid Mirror, an anthology of all women and women-identified writers, I had two poems appear, "Scenes From a Women's Bathroom Stall" and "Mi Pelo." 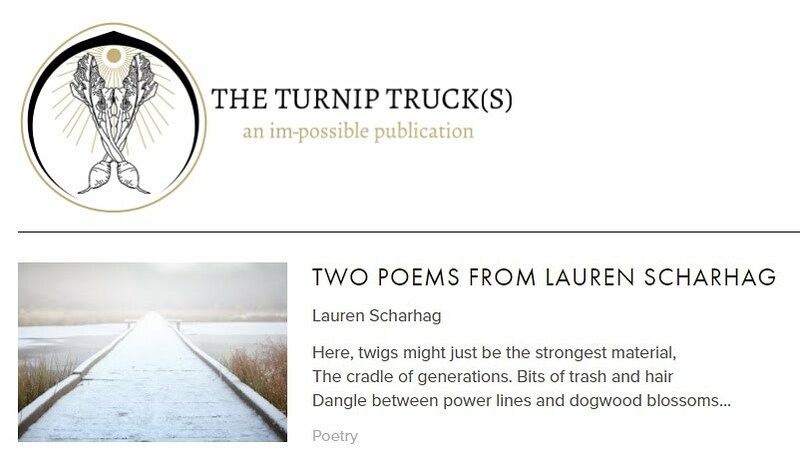 If you enjoy my poetry, swing on over to Instagram and check out my poetry account, @laurenscharhag. A lovely person there named Luke Saint Hill read and reviewed the edition of Into the Void in which my work appeared. He said, it "contains a range of edgy and hard-won poems. I especially enjoyed Lauren Scharhag's 'Nuestra Señora de Ogilvie,' about a family hair washing ritual... There is tenderness and humour but it ends with a sting, navigating towards the 'price women pay' for beauty and acceptance." Cheers, Luke! Follow him @lukesainthill for more lit mag musings.